World’s richest person, Jeff Bezos. Amazon tops $500 billion market capitalization. More cranes in Seattle than any other U.S. city. 50% more than L.A., which has six times the area. More open software jobs in Seattle than in Silicon Valley, which has many, many more employers and people. Housing prices are at a faster growth rate here by far than anywhere else in the country. It’s…a little overheated. And it’s not slowing down. It’s not even a bubble per se. We have rapidly growing companies sucking in employees as fast as they can. Our unemployment rate is well below 4% in Seattle, far lower among white-collar and technical jobs. We have relatively little land on which to build office buildings, and they’re filling up like mad. The scarcity increases prices. We’ve long been a city without enough density for the future and loads of single-family dwellings, no good plan for affordable housing (changing slowly), and land-use plans that discouraged the kind of buildout we needed. Nobody wanted it in their backyards. The pressure has caused changes that mean we have massive amounts of construction happening simultaneously because the demand is so high for everything. Thank goodness we funded light-rail finally a number of years ago and approved and built more streetcar lines with more to come. While that represents just a portion of all commuting, it’s going to be every more critical as driving gridlock sets in. I’ve had to drive in and out of downtown Seattle during evening rush hour for my designer in residence position at the School of Visual Concepts — a place caught in the pincers between two rapidly expanding areas — and it feels a lot more like Los Angeles rush hour (which I’ve been in several times in the last several years) than Seattle. It's about ethics in journalism. Seriously, it is. The rise of direct funding of creative and business projects through Kickstarter, Indiegogo, and others, and the ongoing support of same through Patreon (which is not sui generis, but generates the only substantive volume), brings out new issues regarding conflicts of issues between journalists and the people and organizations they cover. This has been highlighted speciously as a major component of GamerGate (GG). Somewhere a few months ago, it became a trope in the harassment campaign against Zoe Quinn (that morphed into GG) that journalists contributing to Patreon projects were de facto corrupt: their collusion in helping a creator make things on a regular basis (Patreon is per item created or per month) meant that they couldn't fairly review or write about that creator's work. There's a kernel of truth in this. It's not absolute, and the basis on which the conflict arises isn't the one that GGers maintain. Journalists are expected to avoid conflicts of interest. As I wrote a month ago, personal ethical standards and disclosure to one's editors are key tenets in avoiding conflicts. Editors have to be vigilant as well, especially when dealing with large numbers of freelance writers, to ensure that policies aren't violated. Hanna Rosin penned a remarkable example of this in The New Republic recently, describing getting back in touch with noted fabulist Stephen Glass, who was a good friend of hers at that publication before his lies were uncovered. It's both a work of solid journalism and a deeply personal essay that's informed by her biases and emotional response, which she reveals as she goes. Reward-based crowdfunding was essentially zero in 2009, and now represents hundreds of millions of dollars a year. A recent US law also enabled investment-style crowdfunding, which will likely grow into the billions per year, but is more easily dealt with, because a return on the investment is expected, and thus conflicts must be avoided. If I give $50 to a Kickstarter campaign and am both supporting a person making a thing, but also expect to get a DVD and a poster of the final result, is that a conflict? The answer would seem to be no. In that case, it's like a pre-order, even if it costs more than the final result, because I'm getting something premium. Do I expect something from the creator as a result? Only the reward. It gets murkier, in my view, when you go into purely patronage level support. If I give $1,000 to become a Supreme Angel of a project, and get my name emblazoned in the credits, can I credibly write about the project later? Again, disclosure matters. If I want to write about it, I have to be clear with my editors that I paid that money and my name is splashed all over the place. I have a bias towards the project's success as a result. In Patreon, the equation is typically different. Patreon offers ongoing support for creators, where you pledge a fixed amount that is billed either monthly or at project milestones, such as the creation of a video. The nature of support is different. The goals may be specific (an artist plans to make five new casual videogames over two years), but the intent to me always seems more warm and fuzzy than with a goal-based, closed-end crowdfunding campaign. It's de minimus: something so small, that it doesn't matter. In aggregate, 5,000 people giving $1 per month each is significant; but my individual contribution is nearly meaningless on its own, except as a point of morale and support. If I were giving $20 per month, that's not much each month, but it starts to add up to something decent over a year. I think the crux is that aspect of support versus purchase. If the primary intent, expressed even by the low dollar amount, is for me to indicate that I agree with someone, that is a conflict, even if there's no "corruption" to use GG's favorite word. I am not corrupted by giving money, nor the recipient by receiving it. But it does indicate the basis of a relationship, and should be disclosed. When I give $25 to a Kickstarter campaign, it's both de minimus and it doesn't indicate that I care for more than the value of what I'll get in return. I supported Brianna Wu's Kickstarter campaign to bring Revolution 60 to Windows for $25, but I don't own a PC, and it was a gesture of support. But I also publicly promoted the Kickstarter, and as someone rallying others to contribute, it would only be fair for me to be clear in writing about the game or Brianna that I was a booster. Rather, it boils down to personal agency. Most people who write about games are freelance or independent. Freelancers (like yours truly) are allowed a lot more leeway, because we don't strictly represent a publication. This requires that we disclose more to ensure our editors aren't tripped up by connections they don't know about. But it also means we're more free to engage outside one aspect of our professional lives. Some games writers make games; some game developers also write. Full-time writers face many more restrictions already against what they can do because of that paycheck. Kotaku decided Patreon, for some of the reasons I mention, is simply too entangling in general, and now bans contributions through that means by all their writers. Part of the irony in GamerGate is the idea that many indie developers and games journalists make robust livings from their work. One trope in GG has it that both categories are nearly entirely comprised of those with parental wealth, trust funds, or millions earned through other means. Yes, GGers seriously believe this. It's the thought that counts more than the money: if all publications banned all contributors from using Patreon, I would suspect the reduction in patronage would be slight for any individual creator. Most games journalists don't make enough money to support anything heavily. Serial is the most accessed podcast ever from iTunes, according to Apple. By November 18, it was downloaded and streamed 5 million times. The show claims some 1.5 million listeners per episode, of which nine have so far been produced. That would mean nearly 9 million downloads or streaming sessions (assuming people went back to listen to the whole thing) from non-iTunes sources, which seems high, but would also indicate a better distribution of means by which people obtain podcasts, which is good for all podcasters! David Carr, the lead media reporter at the New York Times, wrote that the episodes were downloaded "at a cost of nothing," which may refer to what it costs to deliver or what listeners pay; hard to tell. But I'd like to guess at the amount. What does it cost to deliver that many episodes? But, as my information technology friends tell me, that's way too much to pay; instead, Serial is using a content distribution network (CDN), which is designed to take media files and feed them out a bazillion times more cheaply and efficiently. Serial's CDN, Highwinds, doesn't publish its rates and any CDNs only offer private estimates, but MaxCDN has a rate schedule. Serial would pick the 150 TB per month plan, which runs $6,144 per month plus 4¢ a GB over 150 TB ($40 per extra TB). That would be over $18,000 so far. CacheFly has a bandwidth calculator, and reckons a bit over $3,700 per month for 135 TB, or about $11,000 so far. If Serial has cut an excellent deal, piggybacking as one expects on This American Life's downloads, it's probably paying the least possible, and that sub-$4,000 per month figure seems accurate. But in public radio, that's the same cost as part or all of a full-time entry-level-or-above position. If the show becomes more popular, the costs go up as well, where conventional radio distribution has a very high fixed cost and none of these sorts of high variable costs for extremely popular programs. Some podcast and audio hosting sites, like Libsyn and SoundCloud, absorb some or all of the bandwidth costs — but they're still paying the piper, even if they bill $0 to the podcast producers. Over time, the price of data transfer has dropped relatively quickly, but it doesn't plummet nearly as fast as hard drives or hosted storage. In 2006, Amazon charged 16¢ per GB for downstream transfer (its servers to the Internet); in 2014, it's 33% lower, or 12¢ per GB. In the same time, hard drive storage dropped from 60¢ per GB to 3¢, or a 95% drop. Increasingly successful podcasts will need to budget serious sums that, as listenership grows and prices slowly drop, might stay constant for a while, and be a significant line item in the budget. With our friends at Cotton Bureau, The Magazine is offering a limited-time-availability T-shirt to commemorate our 28-month run, which ends next month. The color is from Issue #1. The back shows our three-diamond "end of story" icon and our run date. This shirt is an American Apparel Tri-Blend Tri-Black with long-lasting ink — I've got others from Cotton Bureau using this method, and they remain vibrant and stand up to many, many washings. There's a book I bring up all the time in talking to people about innovation, creativity, and spaces. 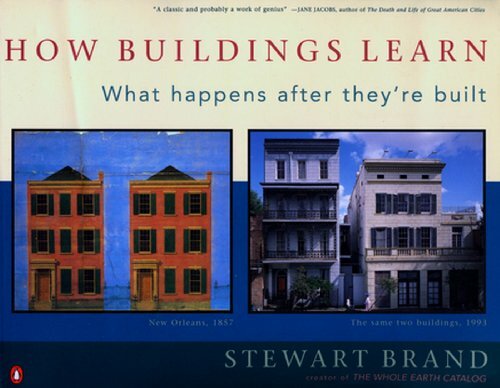 It's Stewart Brand's How Buildings Learn. I have probably mentioned in it 10 episodes of The New Disruptors because it's so relevant to people getting themselves off the ground, often using odd or temporary spaces. While Brand looks across a whole swath of issues relating to architecture and the changes that occur to buildings over time (even ones that are claimed to be historically fixed, and are not), the part I like to point to is the importance of space that nobody cares about. That is, space in which you can experiment, drill holes in the floor, knock out walls, install plumbing, paint walls and repaint them, build and restructure offices. This is usually in old buildings or facilities that people have decided not to update — or are even destined for demolition. 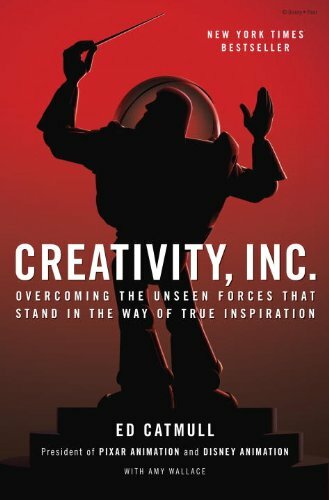 I have to add to this book one I've just read by Ed Catmull, one of the heads of Pixar, and its driving force from the beginning. He, Steve Jobs, and John Lasseter developed it into the powerhouse combination of research lab and movie studio that has churned out a series of successes. Catmull and Lasseter took what they learned to Disney's animation arm after Pixar was acquired by Disney and turned it around as well. Creativity, Inc., isn't about success. It's about failure and managing failure. Catmull unsparingly describes the many hundreds of times he and his colleagues made errors in judgment often based on continuing something that had proven successful, even when they thought they were already taking into account the bias of success. It's revealing from a man running a company that, to outward appearances, has done nearly everything right. It's a good read about the history of computer animation and the studio, but it's packed with lessons that are applicable to an army of one (like yours truly) or a large corporation. We had a very nice, long conversation on The Incomparable podcast as a book-club episode about what this book has to teach. The Magazine: The Book is nearly at 50% of the goal we need to make it happen. Kickstarter campaigns can follow a few arcs. They can flatline, which is about 20% of them, last time I was able to get statistics. 20% of all projects approved by the company get no bids. Another 20% get less than one-fifth of the way to their goal amount. 16% of all projects fail between about 20% and 50% of the total amount they plan to raise. But at the halfway mark, when you raised 50% of your total, the odds are pretty dramatic: 97% of Kickstarter projects that fund halfway proceed to fund fully by the end of the campaign. We're about 48% of the way to our total, and I'm confident that, as we hit our last 12 days, we'll start to see some steam as people both see that it's coming to a close and it's not fully funded. It's an exciting thing, and daunting, and nail-biting. But we'll get there. The campaign covers all the costs of paying for design, printing, shipping, and contributors, and will leave us with some print books left to sell and the ebook to offer online. It's a great way to run a project like this: to scale production with actual demand. I'll admit that it's scary to sit here with about 33% of the time and 50% of the money left to go — but I also feel strongly about the stories in the book, the design that's being created for it, and the interest in making something cool and new that people will enjoy. Thanks for those of you who have backed the project already, and I hope those who haven't will consider jumping in to get a copy as soon as it's hot off the presses!